Police have been ordered to hunt and destroy a great white shark which killed a teenage surfer near Adelaide in South Australia on Thursday. Acting state premier Kevin Foley said the shark should be killed, even though great whites were a protected species. "A large shark in close proximity to the beaches, that is posing a direct threat to human life, should be destroyed," Mr Foley told reporters. But the victim's father said he did not want his son's killer hunted down. "We don't advocate the indiscriminate killing of any shark," Philip Peterson said after visiting the scene where his son Nick died. Nick Peterson's family and friends gathered at West Beach on Friday, and laid flowers along the shore as an impromptu tribute. Peterson was attacked after he fell off a surfboard, which friends were towing behind a small boat about 300 metres (980 ft) offshore from West Beach. 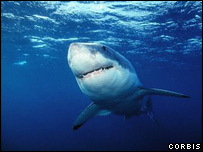 Witnesses described seeing two great white sharks - one up to five metres (16 feet) long - at the scene of the attack. But police and rescuers now believe just one large shark killed the teenager. Adelaide's beaches, normally packed in the Christmas holiday season, were quiet in the wake of the attack, as police searched the area for the killer shark. Sea Rescue Squadron spokesman Fraser Bell said two sightings had been made early on Friday. "It actually came to the surface and swam under our rescue boat, so we do know it's still in the area," Mr Bell told the French news agency AFP. On Friday rescuers also found what they believed to be human remains in the water close to where Peterson was killed. The remains have been sent for forensic testing. Thursday's fatal attack was the third in recent months in Australian waters. A 38-year-old man was killed by a shark on the Great Barrier Reef off north-east Australia on Saturday. Do you live in the area and are you worried about the chance of another attack? Do you think protected species should be killed in order to safeguard humans? The ocean belongs to its inhabitants. When we enter its realm we are subject to its rules and we are agreeing to take our chances just by entering. Large sharks surround this country and their food supply is being diminished by over fishing. It's only natural that they seek alternate food sources. If my family or friends were on the receiving end I would feel anger towards the fish but I would hope that I could come to my senses and realise that an endangered species need protection instead of further eradication. Sharks should not be killed for acting naturally in their own environment. People should accept that they are taking a risk being in the water. Safer areas for surfing and swimming should be created, such as electrical shark repellent barriers. I am a native Kiwi and have spent many years swimming in Australian and NZ waters. People need to accept that the risk of these attacks are remote in the extreme when compared to the daily threats we face, such as road accidents. Not only should these fascinating creatures be protected, but so should we ensure they and other predatory sea life have a sufficient supply of food to avert these kinds of attacks. It is striking when even the members of victims continually concur with this view. I support Nick Peterson's family in their insistence on not killing the shark. For one thing, the shark has probably left the area, and there's no way of determining whether a shark found is the right one. This is no time for being hysterical. Watching the same news shows with reports of murder, assaults and dangerous driving, I saw that other people are a greater danger to us than sharks. Let's all take care this summer, wherever we are. I believe that sharks should not be killed if they attack humans. You are in their domain and so therefore you should respect that. Sharks should not be killed for doing what they do instinctively. Having been a surfer for more than 20 years I have seen and been in the water with sharks. It is a risk but still a very small one. You have to be unlucky, and for every shark you see there are 10 you don't see. Instead of killing the shark it would be better to tag it and track it remotely. Perhaps we could learn from it. We could tell swimmers when to leave the beaches. Eventually it might move onto deeper water anyway. I agree with the victim's father Philip Peterson. There should not be indiscriminate killing of any shark. It's their environment. Shark attacks are very rare. It is much more dangerous driving to the beach. The sharks are magnificent animals and should be left alone. It is impossible to identify the correct shark until after it has been killed, by which time it is a bit late. I live in Adelaide and occasionally swim at nearby beaches. If swimming alone I always stay close to the shore and keep an eye out for sharks. I've never seen one. I don't think that one death should provoke a shark revenge killing but if there are other attacks or fatalities in the area in the next year or so then I'd support a culling. There are some commercial tour operators in South Australia who offer opportunities to swim in protected cages with sharks. I recently met a British backpacker who was looking forward to this experience. She said that shark sightings are more or less guaranteed by the tour operators. If so I wonder whether sharks may be fed to induce them to remain in the vicinity to be swimming companions for the tourists.